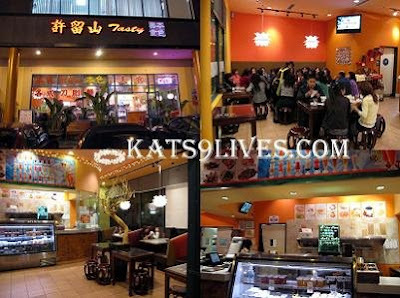 I thought the decor inside was cute with all the lights and Asian touches. The fake tree with flowers was super cute so it gets its own photo. ^_^ Still, my mood was immediately turned sour after the "NO picture" fiasco. 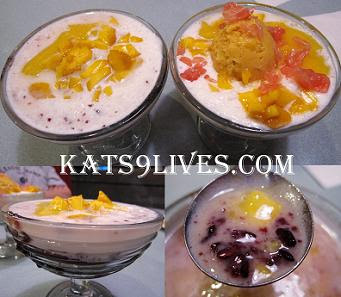 KFP recommended the Mango, Sticky Rice, and Coconut Juice cold dessert. It looked good since it was a mixture of so many great ingredients. I did not like the bits of Red Rice that reminded me of Red Beans! blech! The texture was chewy and a bit gritty. My face turned sour after one bite and from just seeing the red rice. TP and KFP commented on how dramatic the change was >P. The taste was not what I imagined. It was really light and not sweet at all. No flavors really popped out and it was so watery. I wish I'd ordered what TP got.